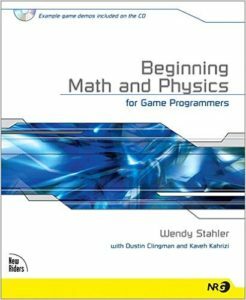 Today I will be reviewing Physics for Game Programmers by Grant Palmer, another stepping stone on my quest to build a custom physics engine. Overall I enjoyed reading the book, and I feel like I learned a lot of general things but not enough to base a physics implementation on. Please read on for more details. What I found most interesting about this text was the explanations of certain aspects of physics that I had not seen covered before. 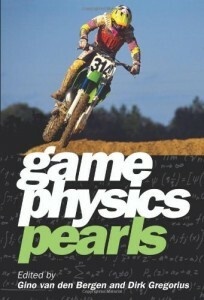 I have already read about 3 or 4 different books all on game physics, and I was expecting this title to be more of a refresher than anything. However, I was surprised to find a lot of things I didn’t know about. In particular, the coverage of drag forces was extremely detailed including things like turbulent and laminar flow and the Reynolds number. Some of the topics covered include: Newtonian mechanics, kinematics, projectiles, collisions, sports simulation (golf, soccer, basketball), cars and motorcycles, boats, airplanes, rockets and missiles, explosions, and lasers. Quite a lot in a little under 500 pages. There is certainly a breadth of knowledge living inside this book. It was undeniably an interesting read, and I felt like I learned a decent amount. However, I am not sure it really got me any closer to building the physics engine I have set out to create. Let me explain. While there are equations listed in the text, and some example code is given, it is mostly used to support the 2D sample applications. I am not sure there is much I could just pull from the book an paste into a 3D engine. The concepts are sound, and it wouldn’t be a huge stretch to make it work, it’s just not spelled out for you. To be fair, some topics are explained well, like his discussion on differential equations and drag forces among other things. My main gripe with the book is that it did not really try to explain rigid-body dynamics at all. There are some interesting things talked about, like sports and boats and planes and all that. And certainly there are probably a ton of sports games and simulators that would benefit from that focus. For my purposes, I was looking more for a rigid or soft body solver, and how bodies can interact with each other. Unfortunately, that was not discussed at all. It’s not that I want to get down on Physics for Game Programmers, and I think Grant Palmer did a great job within the scope of what he was trying to do. The book was entertaining and relevant, it just wasn’t a one-stop-shop for all your physics needs. However, it does cover some basic things well, and includes topics not even touched by some of the other books I’ve read. That alone would make it worth reading, just set your expectations correctly. Once you are ready to make an actual implementation, you will likely need to seek other books or papers. But I guess it is almost always the case as one book can rarely impart all the knowledge you need in any given topic. To sum up: I liked it but wanted more. I can say I had a pretty good time with Physics for Game Developers: Science, math, and code for realistic effects by David M Bourg & Bryan Bywalec. It is a very approachable text, and makes a somewhat complex topic more manageable with concrete examples. It’s definitely a book about 3D physics, but many of the samples are done in 2D for clarity. I did not find this to be an issue, and most of the equations and code were digestible. I did see some heat on the reviews, saying that there were errors in some of the code. I could not verify this, but just from reading the book the authors seemed knowledgeable. At the beginning, each chapter covers a fundamental aspects of physics. Later they go into examples that could be used in a game. Some of the topics covered include: Newton’s laws of motion, kinematics, force, kinetics, collisions, projectiles, particles, rigid-bodies, springs, aircraft, boats, cars, guns, sports. In the last section it goes over some emerging technology and how they work, like touch screens, motion-sensors, 3D displays, and the physics of sound. I very much enjoyed the whole book, and liked that there were practical examples to go along with every topic. Many technical books can get lost in the math equations, but I found this text to have a good amount of explanation and not too many long proofs. This could be a pro or a con. On one hand it makes reading it a little more straight-forward, but on the other-hand, it may leave out some important details when it comes time to create your own implementation. I’m not sure I would want to base a physics engine solely on this book. It’s not that it was bad, but it was more of a general concept thing than giving you all the code. That said, there is a good amount of code in the book, it just may not be as complete as some other sources. Overall I was satisfied with Physics for Game Developers. It may not be my favorite physics book (I found Game Physics Engine Development to be a lot better for my purposes), it still seemed worth reading. Now I am beginning to realize the creating a physics engine will not be easy, but the more I read the more I feel capable of this task. I think the book has helped. In this review, I will discuss my experience with Game Physics Engine Development: How to Build a Robust Commercial-Grade Physics Engine for your Game by Ian Millington. This is actually the first book I’ve ever read solely on game physics and I think I made the right choice here. Although I have developed several physics engines previously, they were only in 2D and the extra dimension complicates matters significantly. Game Physics Engine Development is a book specifically about 3D game physics, though the author does make a short reference to 2D physics at the end. I felt like the book had just enough math to explain the concepts, without getting bogged down in technical minutia. I also enjoyed the friendly writing style, the approachable implementations, and a rational coding standard. Ian Millington’s book covers a lot of ground, and each chapter builds up a single aspect of the engine. Many chapters could stand alone in one aspect or another, though they do come together at the end. Some of the topics covered include: basic 3D math (vectors, matrices, quaternions), laws of motion, particles, rigid bodies, mass aggregate physics, springs, collision, contact resolution, velocity and acceleration, torque, friction, broad-phase collision detection, bounding volumes, and more. While the book is “only” 552 pages, there are a ton of things packed into those pages. I found the coverage to be fairly in-depth, without getting lost of mathematical proofs or anything like that. The book is very practical in that way, and a lot of the code samples could easily be the basis of a real implementation. Overall I enjoyed the book at lot, and breezed through it within a week, eagerly anticipating each new chapter. Being the only physics book I’ve read so far, I don’t feel 100% confidant creating a physics engine myself just yet. However, I do feel it has explained a lot of key concepts necessary in physics development. The book was everything I was hoping for, and gets my recommendation. This has got to be one of the more insane physics demos I’ve seen so far. Most physics engine handles the basic rigid bodies and such, but start to fall apart with more complex interactions (i.e. fluid and cloth simulations). With the demo shown above, from Nvidia, it seems these difficult problems have been solved. Cloth, fluid, smoke, and rigid or soft bodies, all interacting with each other? It looks great. The author, Mike Macklin, has even posted a pre-release of the SIGGRAPH paper explaining the technique here. I took a quick look, and I will be giving it some serious investigation soon. These types of complex physics interactions are exactly what I am trying to do myself. Hopefully the implementation will not be that difficult, but I have a feeling I have a long road ahead of me. Wish me luck!